Teens make some new friends of the two- and six-legged varieties. Photo by Kellie Lewis. What exoskeletons are Lurking in YOUR Home? Anyone with a basement knows that we all have multi-legged exoskeletons, and when we run across them, we usually choose between squishing them, catching and releasing them outdoors, or letting them be. But a group of researchers with the Your Wild Life group wanted to do something else: study them. At our March 15, 2013 Open Minds Café in Whiteville, NC, Dr. Michelle Trautwein, Assistant Director of the Biodiversity and Earth Observation Lab at the North Carolina Museum of Natural Sciences’ Nature Research Center, spoke about the citizen science project that she is involved with, Arthropods of Our Homes. In this study, Dr. Trautwein and her co-authors surveyed the arthropod biodiversity in 100 Raleigh-area homes by crawling on their hands and knees inspecting every surface in each house and collecting the arthropods that they found. Dr. Trautwein went over the collection process, the three hypotheses the project was designed to test, and the preliminary results of the project. 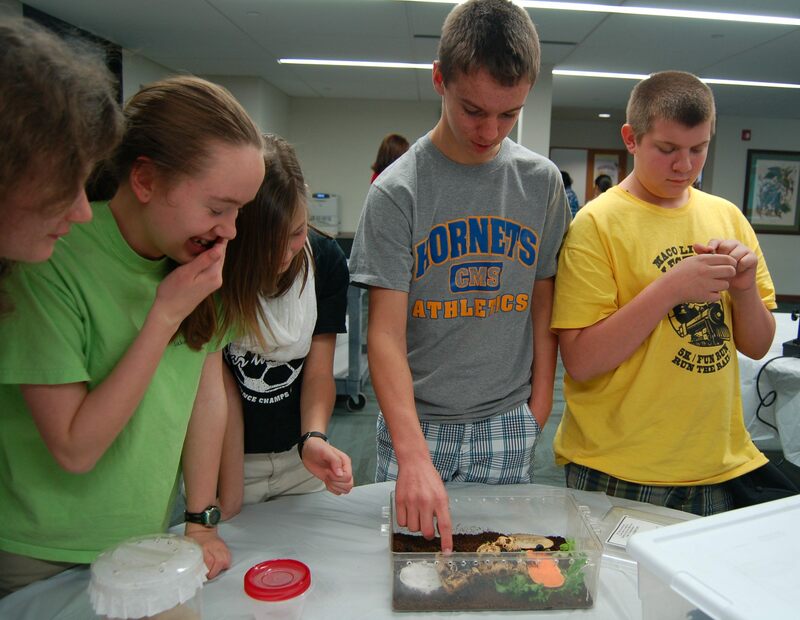 She also introduced the teens to many of the common arthropods that they could find in their own homes, and kept an engaging discussion going and encouraged questions from the audience. While this project is not the main focus of Dr. Trautwein’s research (she is an expert on fly phylogeny and evolution), she chose to make it the focus of her presentation because it had real-life applicability to the teens and introduced them to the concept of citizen science. Dr. Trautwein and the Open Minds staff in Raleigh and Whiteville came up with multiple activities to accompany the talk, following the three stations approach we had successfully done there in the past. For one station, the Open Minds staff in Whiteville had asked their youth leadership team to collect arthropods from around their homes in the month leading up to the talk and then bring them to the Café for identification. They used the gallery of arthropods most commonly found in the study and got the help from Dr. Trautwein when needed. These specimens were laid out at one station with the printed photos from the gallery, and teens were encouraged to sort and inspect them with tweezers and hand lenses. At another station, Dr. Trautwein set up microscopes with dust mites and weevils for the teens to examine even closer. 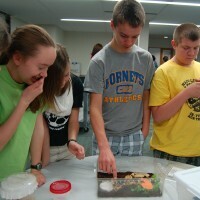 The most popular station was the one with live insects that the teens could handle. 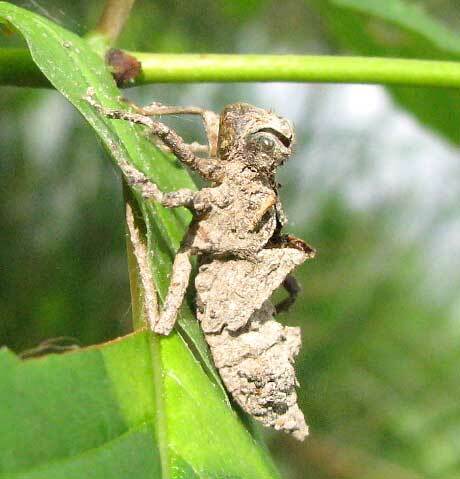 Dr. Trautwein had brought arthropods that were commonly found in and around homes from the museum’s Living Collections, such as camel crickets, a black widow, and bess beetles. The teens were absolutely fascinated by the bess beetles and their larvae, and many of them crowded around to hold and pet the insects. She also brought a display of all of the specimens that were found in a single household, along with a full vial of insects taken only from the living room. As the teens enjoyed the different stations, Dr. Trautwein circulated to answer questions. The Your Wild Life team – this group always has interesting topics, is very focused on outreach and citizen science, and has members spread across the country. One of its members based in Colorado did a Teen Science Café there as well, so check and see if there are any team members in your area.